After undergoing major improvements in the off-season, Timpanogos Cave National Monument is ready to welcome visitors. It is also turning to social media to help manage tours of the popular attraction. 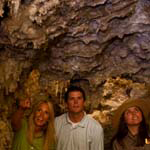 Timpanogos Cave is known for its helictites, its color formations and its three passages. Each year thousands of people hike the 1.5-mile trail to see it. That's one of the reasons the cave now will use social media. "Here in Utah, we're one of the most wired communities in the nation," superintendent Jim Ireland said. "Right here on the Wasatch Front everybody uses social media. It's very popular and it's only natural that we use it to communicate." Last year Timpanogos Cave had an influx of visitors on the weekends and holidays, causing congestion in American Fork Canyon. Visitors can connect to the park with Twitter at TimpCaveNPS and receive updates on ticket availability, weather and other timely information. Facebook friends can learn more about planning their visit, park resources and monument events at facebook.com/timpanogoscavenps. Visitors can also visit www.nps.gov/tica for updates or contact the park at 801-756-5238 for advanced ticket sales. "We're going to try real hard to get real-time information out, and social media is the way to do that," Ireland said. People can buy tickets up to 30 days in advance. Ticket are $7 for adults, $5 for juniors (ages 6-15), $3 for children (ages 3-5), and children 2 and under are free. Seniors (age 62 and over) with a Golden Age Passport or Senior Pass are $3.50. Cave tours are limited to 16 participants per tour. The cave is celebrating 90 years this year. For the first time in three years the park will have a full operational season with no planned closures due to construction projects.The visitors center will be open daily from 7 a.m. to 5:30 p.m. through Labor Day, and from 8 a.m. to 5 p.m. for the remainder of the season. Repeat visitors will notice a number of improvements to the monument. During the off-season, the National Park Service installed a new shelter at the entrance and exit of the cave, complete with new roof to protect visitors from falling rocks. There is also a new staircase and handrails. The National Park Service also installed new LED lights along the trail and inside the cave. "With a cooler LED bulb we won't have as much algae buildup, so that's good for the cave. We won't have to treat that algae. Otherwise, we're going in and we're scrubbing the algae off the cave formations, slightly damaging the cave formation in the process," said Mike Gosse, chief ranger at the cave. "The cave certainly won't be any darker. That was one of the staff concerns, is the public going to be able to see in the cave as well with the LED bulbs, because we want the public to be steady on their feet," Gosse said. Staff and volunteers have been training all week for the cave's opening Saturday, freshening up on first aid and CPR just in case of an emergency. Others have been hiking the trail, making sure it's ready for visitors. "The maintenance staff is busy preparing the trail to make it safe for our visitors to hike up," Gosse said. "The research management staff is busy scrubbing the cave and getting the cave in good shape for visitors to enjoy."